What happens when you start up a limited company with inniAccounts? So you’ve made the decision. You’re leaving the 9 to 5 slog of permie work behind you, and you’re ready to leap into the more flexible world of contracting. Alongside finding your first client or joining the perfect agency, you’ll no doubt be looking at what you need to do to set up your own limited company and get yourself ready for trading. There’s an awful lot to think about, and ploughing through the jargon of Companies House and HMRC doesn’t much help with whittling through the to-do list. Our award-winning service includes everything you need to start-up. For free. We’ve got a crack team of experts who have helped thousands of contractors get up and running using a limited company. We’ll form your company, get you registered for everything you need and best of all it’s free until you land that first job and start trading. We aim to get you started on the right foot and to help you stay on top of your admin and finances from the get-go, so you can focus on building your business as a contractor. Your dedicated Account Manager will be there for you as often as you need them. No matter how many questions you have – they’re there to deliver a comprehensive service that’s second to none. They’ll drop you a call to introduce themselves, get to know you and answer any questions you might have. You’ll hear from them regularly as they guide you through every step of the start-up process. Once you’ve sent us over your ID, we’ll get your company incorporated. You can then officially start trading. Your directors and shareholders will be appointed and registered at this point. Our team will ensure your new company is structured for maximum tax-efficiency from the off and we’ll take care of issuing your share certificates. For your privacy and convenience, we can even register your company at our address and handle your statutory mail. If you’re signed up to our pro-active package, your accountant will review every aspect of your new start-up, and drop you a call to chat about your company and your plans. They’re on hand to not only ensure you remain compliant but to get to know your objectives and support you in achieving them. As soon as you’re incorporated, we’ll get you set up in our award-winning software. Here you’ll be able to check that everything’s in place for when you start trading. 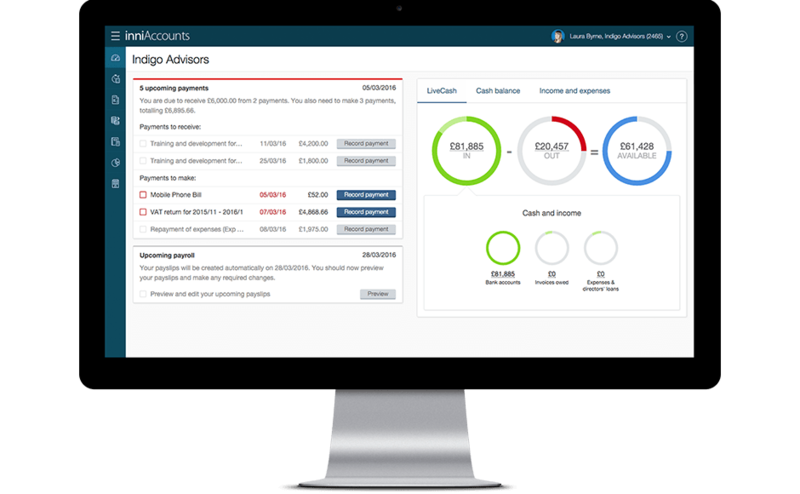 Unlike other accounting software, inniAccounts is built exclusively for contractors. Once you’re trading, you’ll be able to use it for everything from claiming expenses and issuing invoices to managing your bookkeeping. It provides a clear, 24×7 view of your accounts and taxes, so you can effortlessly stay ahead of your finances and make assured decisions. Take a look at our demo for a full experience of our software. A limited company has a number of important documents, one of which is its Certificate of Incorporation. Now that your company is formed, you’ll be able to find this in your inniAccounts software and use it to open a business bank account. Just pop into your local branch and chat with a business advisor. Once you’ve opened your account, let us know and we’ll update your bookkeeping within the software for you. Bank transactions can be imported into inniAccounts by uploading electronic statements or, if you’re a Barclays or CashPlus customer, by using automatic bank feeds. Bank feeds are a secure, read-only link between your account and our software. They import your bank transactions automatically every day, saving you time and ensuring your records are accurate. You might also require your certificate if you intend to work with an agency. We’ll liaise with agencies large and small and provide them with the documents they need to draw up your contract. We’ll also get everything in place for you to raise your first invoice, so there’s no delay in getting paid. We’ll deal with HMRC on your behalf, including registering your company for Corporation Tax, VAT (if your company requires it) and PAYE (enabling you to create payslips and pay a salary to yourself and any employees you might have). If you need it, we’ll put you in touch with any of our large range of partners who provide specialist services to contractors; such as business banking providers, insurance and protection advisers, IR35 experts and more. As you secure your contracts, we’ll be there to ensure managing every aspect of your accounts remains effortless. Your Account Manager will touch base with you every three months with a full account review but you can drop them an email or a call anytime. However big or small your queries, they’re there as often as you need them. Is it really free while starting up? It is! We will incorporate and register your company at no cost to you. With our Pro-active and Managed services, if you don’t expect to start trading during the first month of our appointment, we won’t charge you our monthly fees. We will continue to waive them until you start trading, up to a maximum of six months.